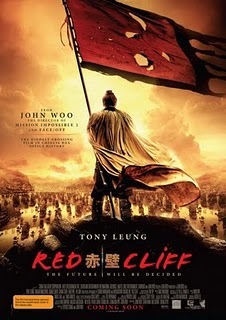 Red Cliff – sp- If Steven Spiegelberg were to decide to make a blockbuster movie about the US North-South Civil war and the Battle of Gettysburg most Americans would probably be quite familiar with the various leaders and generals. Even more so apparently are the Chinese and the people of other Asian countries knowledgeable about the cast of characters who took part in the great battles as the armies of the north tried to conquer those of the southern China, leading to the battle at Red Cliff, which took place about eighteen hundred years ago. Director John Woo felt that this was so much the case that he needed to make two versions of this movie, one for non Asian world with more background material and a two part film with even more details of the actual events for the Chinese and others who are familiar with the historical events. The 2 ½ hour movie which we saw has a brief English narration at the beginning and then is in Mandarin with English subtitles which you soon forget are present. It shows the personal and political decision of the northern dynasty to send it’s huge army which probably numbered in the hundreds of thousands of soldiers to the south to squash the smaller southern coalition. A great deal of the movie consists of battle scenes on the ground and between naval forces. At first we had the impression we were watching a Chuck Norris or Jackie Chen movie that we would only have seen in coming attractions, with bodies whirling through air, swords and spears impaling soldiers, blood squirting out of the period armor, catching spears in mid-flight, horses rearing up, thousand of arrows flying through sky and all sorts of acrobatics. People are being killed everywhere except the main characters who seem to be able to leap between thrusts of opposing soldiers. Then after awhile we realized that in fact we were watching a classic operatic story and ballet in a beautiful setting. John Woo told our film course that he used 1500 hundred Chinese soldiers in the movie and made them look like many times that number of warriors by computer generated editing techniques that he also used to enhance the magnificent appearing background. The movie also vividly shows the brilliant military strategies that were used by the outnumbered army including clever troop formations, innovative weaponry and an exquisite understanding of the forces of nature. Woo also chose to create a story line that was not in the known history of these events that involves the role of some very brave, strong and attractive women.